This 3 kid thing is not so bad. John's bilirubin levels dropped to 16. We celebrated with a long walk and our favorite free outing--the library. I busied myself with the baby upon our return. My heart stopped when I saw this on the leather sofa. "Oooh, that was close!" I think. I'll have to watch her like a hawk today. 3 hours later, I find a discarded tube of Revlon Colorstay lipgloss on the bathroom floor. They aren't kidding when they say it doesn't rub off! We have wiped and scrubbed with every potion I can find. Halloween is over a week away. Any ideas? I'm not feeling so confident anymore! Did you try the Crisco yet? I use the Almay version of the longlasting lip color and find that very heavy grease will help it come off, or eye make up remover. Congrats to you and your family on the latest addition! Have you tried using a cleanser for make up? What about the eye make up remover? My Mom used to love to use dishsoap if nothing else worked. what material is it rubbed into? her, carpet, clothes?? your house looks impeccable for someone with 3 kids, the youngest being 1 week old! My son did get into the shortening a few months back, luckily in the kitchen. I hope I never have to clean that up again! Good luck with the cleanup; you've got some great ideas! I found that using any kind of lip gloss over the 'color stay' stuff that wasn't included with the lipstick usually causes it to get crumbly and fade away. Perhaps some vaseline? If it's on her face try some eye makeup remover. My guess is it "stains", not so good news for a complete face makeover. Have you tried baby wipes? They take off stage makeup! I use this lipstick and love it! I remove it with Mary Kay Oil Free Eye Makeup Reover on a cotton ball. Glad you've made it home and that the babe is doing better. I was going to suggest chapstick or vaseline. A roommate of mine from college always used one of those two to remove the more permanent lipsticks. Hope you find something to get it off! It mostly came off the first day, and the rest wore off in 2-3 days. I think I used to use that very product, though Elise is more daring than I with the red. Mineral oil, baby oil, or eye makeup remover would all do the trick. Good Luck! My three are in their 20s now. Try to remember to ask yourself, every time something happens "will this matter five years from now?" "ten?" It got me through! If it make you feel any better, my 2 year old has decorated her sheets and one of the walls in her bedroom with whiteboard markers this week. Neither will come off. That was a close one with the shortening! That would not have been fun. Vinegar gets off sharpie marker on skin. Ask how I know that, go on ask. Try something oily, like petroleum jelly or mineral oil (the color stay stays only against water-soluble compounds, but dissolves in oily compounds). If nothing else works, I'll be Revlon has an 800 number you can call to ask. My recommendation is the same as several others: baby oil. Hmmmm reminds my of my impy little one that spilled red nail polish on my new 600 count sheets and tried to convince me that her nose was bleeding on the sheets. Of course MY nose picked up the scent of nail polish!!! GRRR...god makes them so cute so their mothers don't eat their young! I use the same "lipstick". When I want to remove it, I just rub some Burt's Bees Chapstick over it. Wait a few seconds and rub. It turns crumbly and wierd and starts to come off. I have a similar picture of one of my children. With the lipstick all over the face. Only my child that got into the lipstick is a boy! That stuff had to come off. Fast! I just did the above process a few times and he was cleaned up in a flash! Good luck! Those Mr Clean Magic Eraser thingies will remove almost anything. Ahh, this is why you should homeschool!! Big brother would help keeping her busy, LOL! An angel in red! How lovely is she!!! Okay, Meredith - I have to admit, I can't stop laughing - so cute! Mr. Clean's Magic Sponge - it wipes away sharpies from hallway walls sister... trust me - color stay lipstick is nothing compared. Have a blessed weekend... Latrice! It took a few applications and rubbing with a soft cotton diaper to get all traces off. Thanks for the inspiration! I'm not sure I would have thought of using Crisco, but it's similar to Alvolene, isn't it? Unfortunately Andrew was 3 feet away while she was applying her makeup! He's great at teaching and engaging her, but I can't rely on a 6 year old for babysitting. Now there's a photo for her 21st. :) Oh what fun!!! 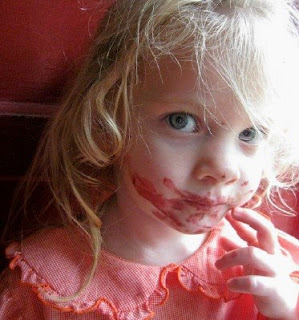 I have lost so many lipsticks during my children's early years. You'd think I would learn but it didn't seem to work out that way. Hopefully you've successfully gotten it off by now but I always found vaseline worked well. Only I have no idea if you have vaseline there or not (the joys of blog readers from other countries). 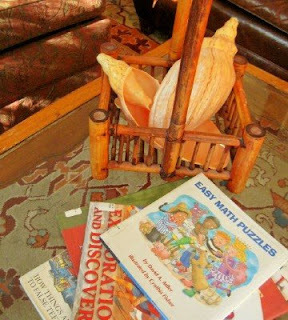 I remember the early days with my three. They are now all in school, my oldest in 7th grade. I remember looking forward to them getting older and being more self-sufficient. I now miss those early baby days and get teary-eyed remembering them. Hold them close and enjoy every minute, even the challenging days. Warning warning warning!!! For those that suggested the Mr. Clean magic eraser. Children have been injured (burned) by these! They have chemicals that burn young skin. If I knew how to add a link I would. I have seen it on other blogs. They are very dangerous for children to handle!! DO NOT use on a childs face!!!!! Glad it came off. I was going to suggest something greasy too. And I cannot believe someone suggested using magic eraser on skin. Ouch! I think the Magic Eraser suggestion referred to lipstick on the walls or floor--not the skin! Magic Erasers do not have chemicals but are made of such a fine microfiber sponge material that they can abrade and "burn" the skin almost instantly. Don't use Magic Erasers on any part of the body--but I do tink they're pretty amazing on the walls! Can't help you with the permanent lipstick, but did want to say that the first time I left the house with three, I locked my tiny newborn in the car with my keys in the blazing July midday sun in the parking lot at Penney's. At least you don't have to call 911 like I did! If you try all this advice and none of it works, try buying a make-up remover or actually CALLING Revlon to see what they think is best. You know, my daughter did the a similar thing several years ago... during her "nap", she found a box of markers and colored ALL OVER HER FACE- even in her nostrils. It just so happened that we had a really important dinner with my husband's boss, so I woke her up JUST BEFORE WE LEFT and began laughing and crying at the same time- because I knew it wasn't going to come off in time! Oh, just thought of something- lime juice might help! Take lots of pictures over the next few days with her and the baby. In years to come you all will have a blast remember back to this time. Well it's a cute picture! ColorStay products mean what they say - VERY hard to get off. You could try nail polish remover. Smelly but it won't hurt her. I've used it to clean up hair color around my hairline, on my forehead, and it's harmless. -- plus an entire stick of butter all over the living room! When I put mine on in the car I get a similar look. I feel your pain Meredith. My daughter constantly has lipstick smeared all over her face. I gave up on getting it out. Although cold cream or dish soap may help. Just don't take her for photos for a bit. My lovely one though put a tube in the pocket of her dress, and I didn't think to search her pockets while doing laundry. I was half asleep one morning when I threw it in the dryer so I could wear one of the shirts to work. Almost the whole load had lipstick, and it and it hasn't come out after 3 washes with different stain fighting ideas. Several pieces are ruined, the rest are just good enough. A few pieces were lucky and came through without any noticable stains. 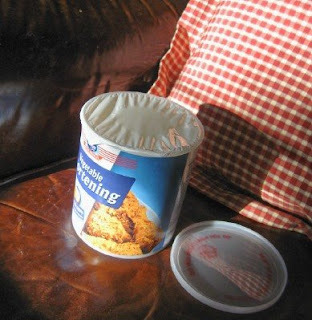 Oh my, a tub of shortening on the couch. Oh no. My kids always thought it was frosting, or whipped cream of something. One taste and they realized IT WAS NOT and they never tried that again. That's ironic that the very item she was trying to get into first was the one thing that took care of the item she DID get into! I remember once my son accidentally locked himself in the bathroom. When we finally got in, he had lipstick EVERYWHERE!!! Those are some funny memories.